Nominations: 2012 ‘Spirit of Venice’ Awards - Yo! Venice! 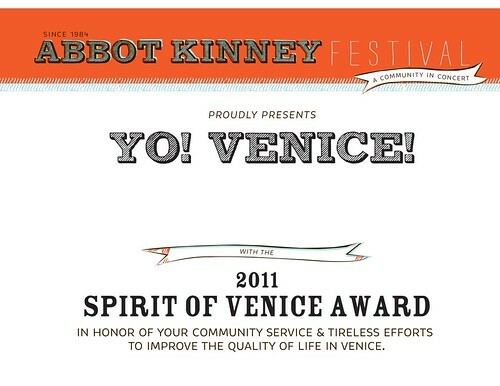 Today is the last day to submit nominations for the Abbot Kinney Festival Association’s (AKFA) 2012 ‘Spirit of Venice’ Awards. The award recognizes those who make significant contributions in the Venice community. The AKFA honors artists, poets, and musicians nurturing the creative environment, and people contributing to the greater good through non-profits and community work. The contributions are many and varied, but the common bond is the recipients’ initiative, vision and strong sense of community. The people who build gardens, develop youth programs, serve our neighborhood selflessly, and foster artistic creativity, are the true Spirit of Venice. The first ‘Spirit of Venice’ Award was presented at the 6th Abbot Kinney Festival in 1989 to descendants of Venice founder Abbot Kinney. The award was created by John Kertisz, Poet Laureate and 1989 Festival Board member to recognize persons who are actively involved in the community and/or serve as inspirational role models. Many Venetians have been honored with ‘Spirit of Venice Awards’ including Vera Davis, Joe Gold, Gregory Hines, Emily Winters, Jay Griffith, Sgt. Theresa Skinner, and Jesse Martinez among many others. The nominees are determined through public survey, with The AKFA Board of Directors making the final decision. Click here to nominate a candidate for the AKFA Spirit of Venice award. The AKFA Board of Directors will determine final awards. Recipients will be notified before the festival and honored at the festival in a brief awards presentation. For more info about the Abbot Kinney Festival Association and the 2012 Abbot Kinney Festival, visit abbotkinney.org, email [email protected], or call (310) 396-3772.